Bunny 17 Digital Downloads Now Available at Conventions! Bunny 17 Media is thrilled to announce that digital download cards will be available at all of our conventions! Are you an ebook reader who attends cons? Is carrying merch a struggle with your cosplay? You now have options! Starting at Rocket Con in San Diego, we’ll have cards available for purchase. Online readers can still purchase and download ebooks from our store at bunny17media.com. Join Bunny 17 Media over the next two weekends at three different conventions! On Sunday, April 8, we'll be at Sun Devil Fan Fair on the ASU campus in Tempe, AZ. 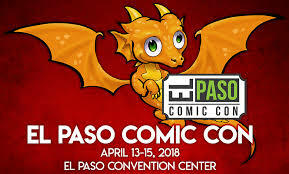 On Friday, April 13 through Sunday, April 15, we're taking over Texas at two different cons; El Paso Comic Con and Yellow City in Amarillo. Check out or Calendar page for more details. We'll see you out there!